A month ago I saw a very nice pair of Minnetonka Ankle Boots at the wndow of a store yelling at me: "Buy me! Buy me!".. I thought poor shoes.. Standing there alone with noone to belong to.. So a month later, they belong to me..
At first I wasn' t sure if I liked them, but now I am! They keep my freezing legs warm and wearing them you have the feeling of walking on pillows! This feeling is really intense! But do you know where these shoes came from? I'll tell you..
First of all moccasins are America's first footwear.. From 1946, Minnetonka represents this style with great success.. Minnetonka Moccasin Company was founded by Philip Miller and now Minnetonka mocs are worn across six continents.. All products are hand-crafted and the materials are deerskin and moosehide. Minnetonka does not only have shoes.. They also have bags and hats..
Last but not least... Celebs love Minnetonka!! Can' t wait to show you outfits wearing them! So happy you got them for yourself! 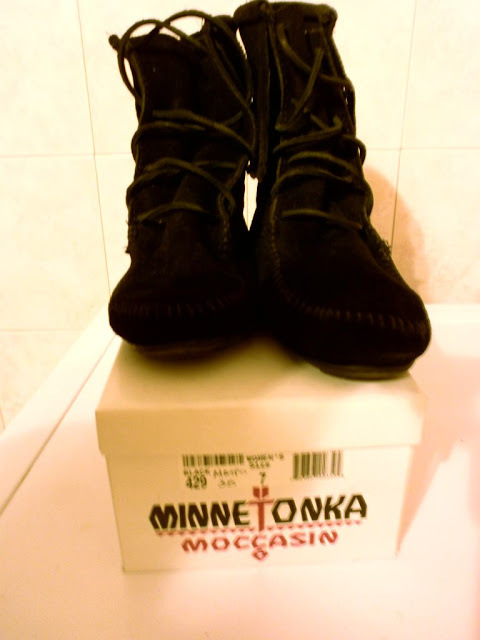 I love Minnetonka's!!! They're super cute and comfy!!! I love this shoes and it is very comfy. Thank you for visiting my blog and for the sweet thoughts. I hope we stay in touch ! Lovely post! I have a pair of black fringed boots too! Hi. Just followed you on bloglovin too. You wanna follow each other on GFC as well? Love Minnetonka's en fringed boots! esas botas con flecos son muy bonitas. Gracias por comentar, que te parecen si nos seguimos.